Wash hands. Wash all fresh produce under cool, running water. Drain well. Preheat oven to 400F. Line a large baking sheet with parchment paper, set aside. Cut the jalapeño peppers in half lengthwise; remove seeds and center membrane. Set aside. Combine cream cheese and Mexican cheese blend in a bowl, add a pinch of salt to taste. Spoon filling equally among jalapeño halves. 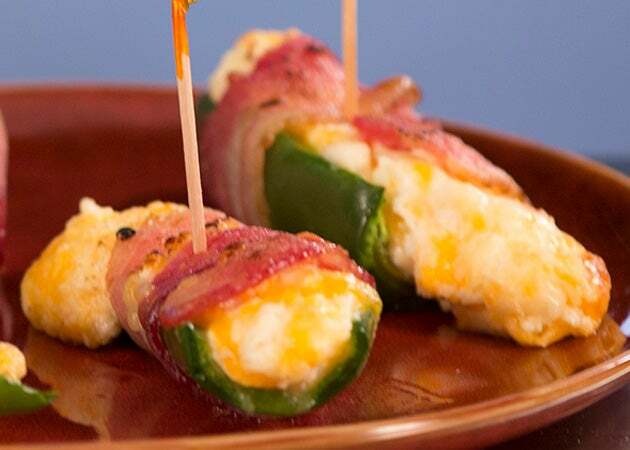 Wrap each stuffed jalapeño with a half slice of bacon, then place a toothpick through the center. Place jalapeños on the baking sheet, and bake for 25–28 minutes. CCP: Final internal cooking temperature must reach a minimum of 165°F, held for a minimum of 15 seconds. Remove from oven, and allow to cool before serving. CCP: Product must be cooled to a maximum internal temperature of 41°F or less, within 4 hours.